After a week of intensifying documentation efforts, the IPM team is pleased to announce that we have finally achieved success in capturing video evidence of a live rat. This was an extremely pleasant surprise as we had been slightly discouraged by the unsuccessful nature of previous efforts. 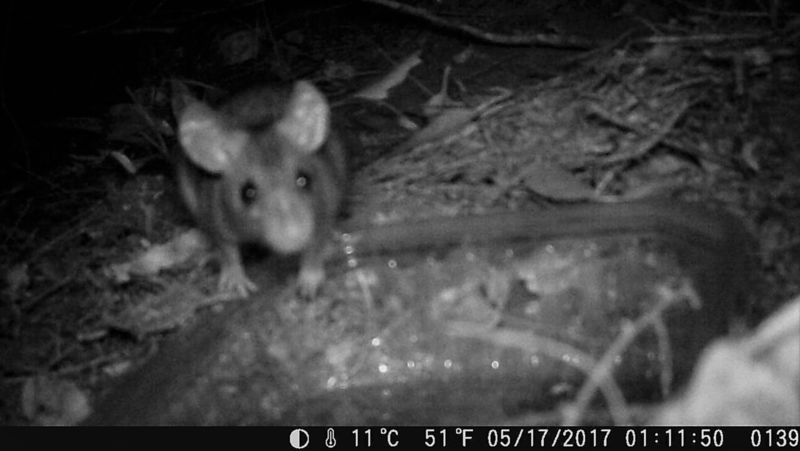 On the fateful night of May 16th, a motion-activated camera, placed by Markus and Nathaniel, documented a rat approaching a water dish they had set up. The video clearly shows the rat drinking from the water dish, while occasionally dipping its head to the right side of the dish – an area where we had placed peanut butter coated twigs as baits. Now that the above data has been obtained, the next step forward is to review the potential implications. The video evidence was successfully captured in a relatively vegetated area, along with the presence of food and water sources. Similar environments around the UCLA campus may be vulnerable to rodent infestations if left unchecked. Additionally, the water dish has proved successful in attracting rodents. Perhaps putting out water dishes as water sources for rodents may indeed be a temporary solution to combatting the problem of chewed irrigation pipelines along Sunset Boulevard. To strengthen the research component of our project, we have been attempting to contact pest departments from other cities and organizations regarding their approaches to Integrated Pest Management. There is no single, guaranteed method of successfully implementing IPM, but the potential of collaboration will guide us in the right direction.